Shares of the company climbed to a high of Rs140.15 after the company posted a stellar 72% rise PAT in Q3FY19. Shares of JK Paper climbed ~2.5% in intraday trade on Wednesday after the company posted strong growth in Q3FY19 on Tuesday evening. The company's shares climbed to a high of Rs140.15 after it posted a stellar 72% rise PAT in Q3FY19. JK Paper Ltd's standalone revenue for Q3FY19 came in at Rs869.49cr, up 10.1% yoy. Operating profit in the quarter increased significantly, up 60.9% yoy, to Rs247.61cr. Its EBITDA margin expanded ~900bps yoy and ~239bps qoq to 28.5% in Q3FY19. Read more. The realizations for domestic paper products have improved on firm global pulp (raw material) prices owing to structural improvement in the demand for pulp and paper; environmental restrictions by the Chinese government on import of waste (recyclable) paper, and a limited supply of pulp capacity. JK Paper has capex plans for setting up 1.5 lakh TPA of packaging board with a total project cost of Rs1,450cr to be funded through internal accruals and long-term debt. 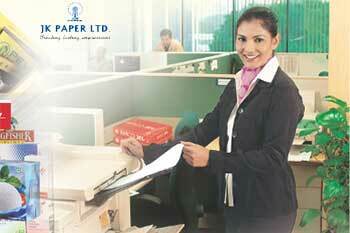 JK Paper Ltd share price is currently at Rs137.50, up Rs3.2, or 2.38%, from its previous close of Rs134.30 on the BSE. The scrip opened at Rs138.90 and has touched a high and low of Rs140.15 and Rs136.30, respectively. So far, 13,15,150 (NSE+BSE) shares were traded on the counter.